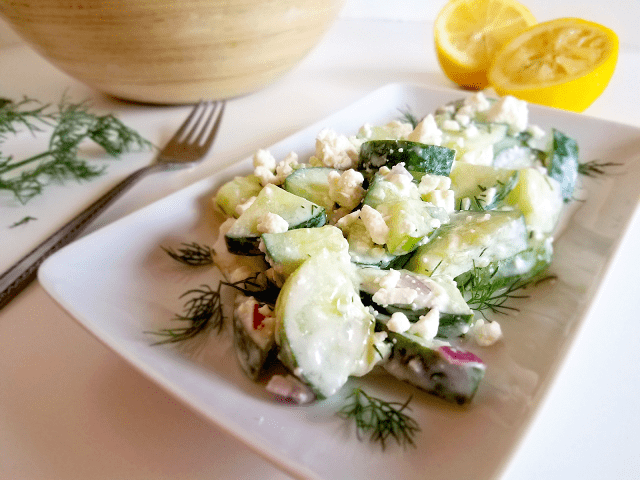 This cucumber salad is made with the delicious and time-tested flavors of tzatziki sauce! Not only is it refreshing and easy to make, it’s nutritious, gluten-free, low-carb, and full of probiotics! I’ve been so busy this summer that I’ve been neglecting my blog and my garden (among other things). Regardless of neglect, our cucumber plants suddenly started producing like crazy. I love cucumbers so I am grateful for the bountiful harvest, but holy cow. Cucumbers are taking over my fridge! This Tzatziki Inspired Cucumber Salad came about as I was thinking of ways to use all of the cucumber I had just harvested. I love Tzatziki sauce, and marrying it with cucumber to make a salad sounded easy and delicious. I experimented a bit to make sure I had the right balance of flavors in the sauce and I was pleased with the results! 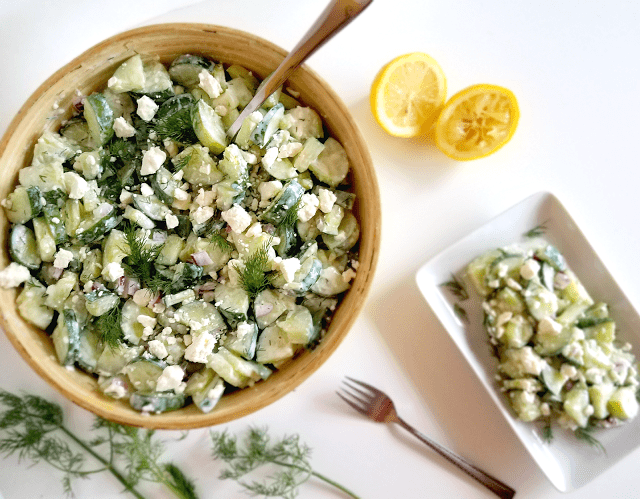 This Tzatziki Inspired Cucumber Salad is flavorful and refreshing. It’s perfect for summer as an accompaniment to any Greek-flavored protein. Of course, it’s also gluten-free, grain-free, low-carb, keto-friendly and nutritious, because that’s how I roll! In addition to being gluten-free, grain-free and low-carb, this Tzatziki Inspired Cucumber Salad is good for you! Cucumbers are not only a good source of vitamin K and molybdenum, they contain compounds that inhibit inflammation, protect the cardiovascular system and may prevent cancer (source). The skins and seeds contain the most nutrients, so be sure to buy organic cucumbers or grow your own so that you can leave the skin on. Greek yogurt is a great source of the minerals calcium, phosphorus and molybdenum as well as vitamin B12, B2 (riboflavin) and B5 (pantothenic acid). In addition, Greek yogurt is a fantastic source of probiotics. Most people have heard that probiotics are good for the digestive tract, but recent research has shown just how many health benefits these tiny bacteria offer. Not only do probiotics help to treat digestive troubles, such as diarrhea and constipation, they aid in nutrient absorption, fight food-borne pathogens, and support the immune system in battles such as allergies, Crohn’s disease, and yeast and fungal infections (source). 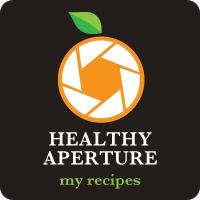 Below are a few tips that I hope will help you find the best ingredients and tools to make this salad at the lowest prices. 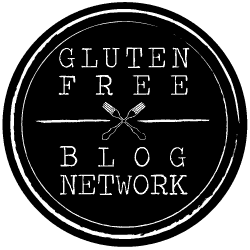 I’ve included links to products for your convenience. Some of them are affiliate links, which means that I may receive a small commission if you purchase a product through one of my links. 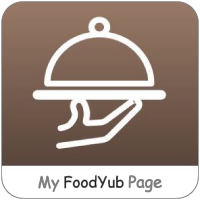 Thank you for supporting Taste Abounds! Insist on Greek yogurt that is produced from organic and grass-fed cows! I realize it costs more, but it is worth every penny. Not only is it immeasurably better for the cows, yogurt from organic and grass-fed cows is less likely to be contaminated with herbicides and offers a better nutrient profile, namely more vitamin A, omega 3 fats and CLA (source). My favorite brands that offer Greek yogurt from organically-raised, grass-fed cows are Stonyfield, Maple Hill and Wallaby. Natural Grocers is my favorite place to buy yogurt. They only carry dairy products produced from pasture-based (grass-fed) cows and they offer those products at relatively low prices. 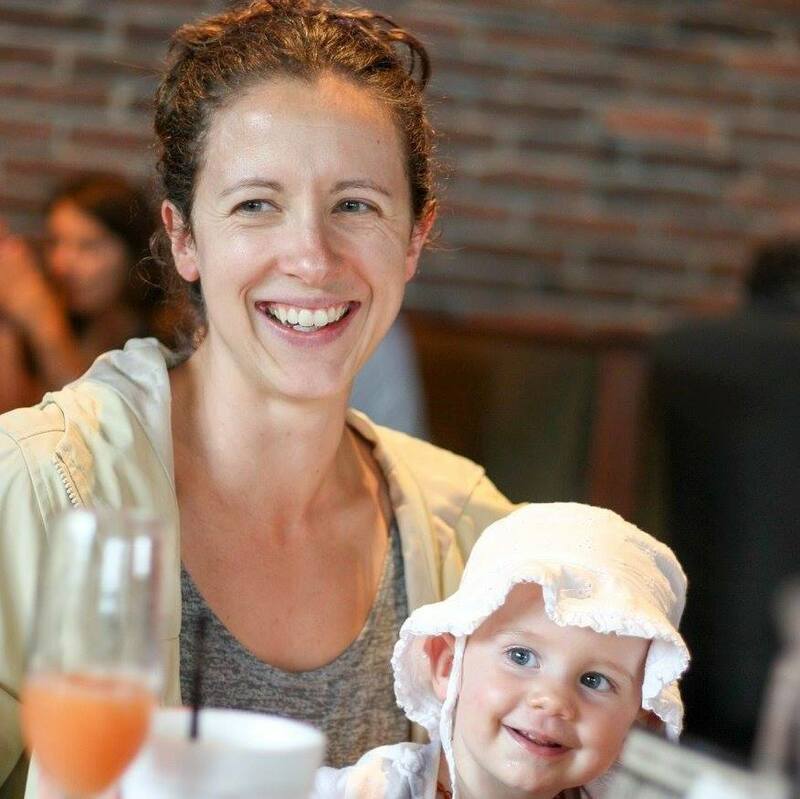 If you don’t have a Natural Grocers near you, try King Soopers, Walmart or Trader Joe’s. As the demand for high-quality organic and grass-fed dairy products grows, they are being offered by more and more retailers. Quality knives are essential for any cook and for slicing the vegetables in this Tzatziki Inspired Cucumber Salad. After much research almost a decade ago, I decided on the J.A. Henckels set with 8-inch chef knife and 7-inch hollow-edge knife. I have used them daily with outstanding results the past eight years, and I expect them to last many more years. They are some of the most reasonably-priced, high quality knives out there! This Tzatziki salad is flavorful and nutritious as well as quick and easy to make. See it demonstrated in the video below, and then scroll down for the complete recipe! 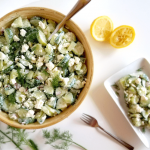 This cucumber salad is made with the delicious and time-tested flavors of tzatziki sauce! Not only is it refreshing and easy to make, it's nutritious, gluten-free, low-carb, and full of probiotics! In a large bowl, combine the Greek yogurt, olive oil, lemon juice, dill, garlic and salt. Wisk until smooth and set aside. Chop the cucumbers into bite-sized pieces. Add to the sauce along with the red onion. Give it a quick toss before adding the feta cheese. Mix well and enjoy! Top with extra dill, a sprinkle of ground coriander or kalamata olives, if desired.